HR 5171, the brightest star just below the centre of this wide-field image, is a yellow hypergiant, a very rare type of stars with only a dozen known in our galaxy. Image released March 12, 2014. A powerful telescope in Chile has imaged the largest yellow star ever discovered. 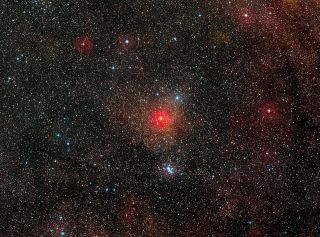 The star, called HR 5171 A, shines 12,000 light-years from Earth in the center of a new image released today (March 12). Known as a "yellow hypergiant," The star is more than 1,300 times the diameter of the sun, much larger than scientists expected after earlier observations, European Southern Observatory officials said in a statement. You can see the yellow hypergiant in a new video from ESO as well. This artist’s impression shows the yellow hypergiant star HR 5171. This is a very rare type of star with only a dozen known in our galaxy. HR 5171 A is 50 percent larger than the red supergiant Betelgeuse, the star that makes up one of the constellation Orion's shoulders. Only 12 yellow hypergiants have been found in the Milky Way, and they are in an unstable stage of life, according to ESO. Yellow hypergiants are rapidly changing, and shoot out material that forms a large atmosphere around the star. "The new observations also showed that this star has a very close binary partner, which was a real surprise," Olivier Chesneau, a scientist of the Observatoire de la Côte d’Azur in France working with the VLT said in a statement. "The two stars are so close that they touch and the whole system resembles a gigantic peanut … The companion we have found is very significant as it can have an influence on the fate of HR 5171 A, for example, stripping off its outer layers and modifying its evolution." Although the huge star is very far from Earth, keen observers can come close to spotting it with the naked eye, ESO officials said. The star shines about 1 million times brighter than the sun. Chesneau and his international team of scientists used a special technique called interferometry to combine the light from multiple individual telescopes, creating a giant telescope they used to observe HR 5171 A, ESO officials said. The new study will be published in the journal Astronomy & Astrophysics.